Monarch Airlines, UK fifth-biggest airline in passenger numbers, ceased trading after its license was refused renewal by the Civil Aviation Authority (CAA). Up to 110 thousand passengers are left stranded on holiday overseas, while the pre-booked flights and all the future bookings are cancelled. 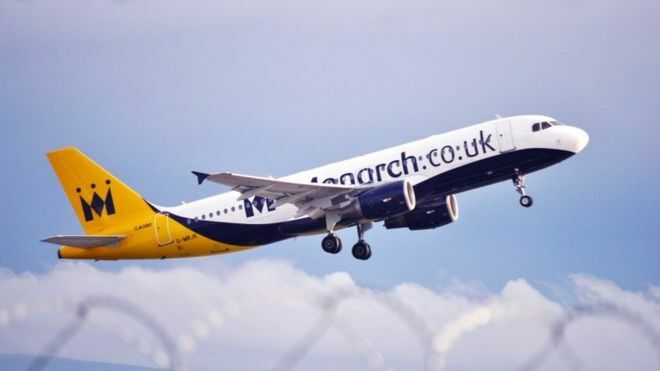 Monarch went into administration after it failed to reach a deal during the last-minute talks with CAA for its Air Travel Organizer’s License (ATOL) renewal, the BBC reports. Monarch group companies, including Monarch Airlines, Monarch Holidays, First Aviation, Avro and Somewhere2stay, ceased trading and now entered administration. As a result, starting from October 2, 2017, all future holidays and flights are cancelled and no longer operating. “This is an unprecedented situation and because there are up to 110,000 passengers abroad, the UK Government has asked the CAA to coordinate flights back to the UK for all Monarch customers currently overseas,” the CAA announced in a statement, stating that these new flights will not cost extra to passengers. The airline has announced the news via Twitter, referring to the CAA webpage for more information. “We’re sorry to announce that Monarch has suspended flights and holidays” the carrier announced. “Please check http://po.st/CAA for further information.” The airline also warned customers to not come to the airports, by saying “Monarch customers in the UK: don’t go to the airport. There will be no more Monarch flights”. Monarch’s license was not renewed due to the concerns over its recent financial losses, fuelled by the troubles amid its short-haul routes. Between the years 2015-2016 Monarch went from £27 million profit to £291 million yearly loss reported in October 2016, according to the BBC. The carrier has been struggling with tough competition from the low-cost carriers such as EasyJet or Ryanair. Contrary to these airlines, Monarch provided its customers an upmarket offering with ticket prices double as the ones offered by the LLC rivals. Monarch also lately endured what could be called “bad luck” as its key markets to Tunisia and Turkey, traditionally generating strong sales, were disturbed by security (and terrorism) concerns, as the Independent points out. According to the CAA, Monarch is the biggest UK ever to enter into administration. Therefore the task to bring back its 110K customers stuck abroad is far from an easy one. The UK’s Foreign and Commonwealth Office called this task the “biggest ever peacetime repatriation to fly 110,000 Monarch passengers back to the UK at no cost to them”. For this reason, the UK government together with the Civil Aviation Authority (CAA) is currently building a temporary airline from scratch that would be one of the UK’s biggest carriers if operating permanently. “That is why I have immediately ordered the country’s biggest ever peacetime repatriation to fly about 110,000 passengers who could otherwise have been left stranded abroad,” said Transport Secretary Chris Grayling. “This is an unprecedented response to an unprecedented situation. Together with the CAA, we will work around the clock to ensure Monarch passengers get the support they need”.